In my analysis yesterday (here) I argued that Dublin residential property prices are simply showing signs of reversion to trend, not 'bubble' dynamics. Since then, numerous reports in the media produced opposite conclusions, with headlines forcibly putting forward an argument for 'bubble' formation in Dublin property markets. Over long run, sustainable property prices appreciation should track closely inflation in the economy. So far is pretty much clear. 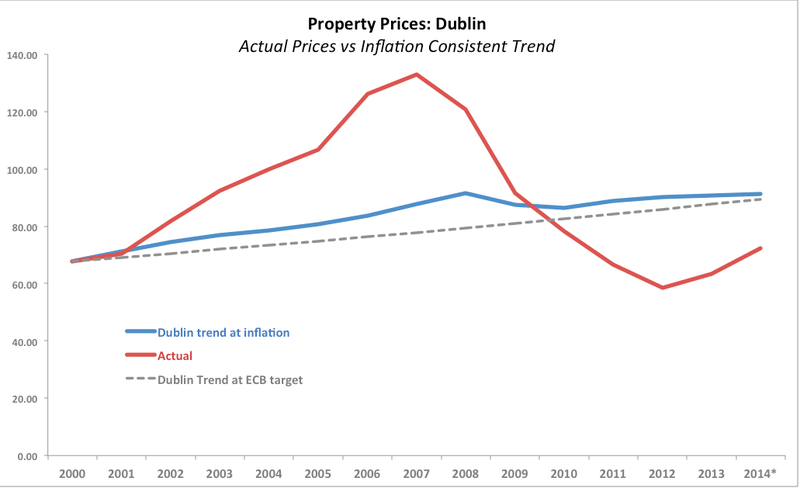 While arbitrary, starting points for trend estimation for Dublin property should start from pre-bubble period of 1999-2001. This is also pretty clear. If property prices expanded at the rate of inflation from 2000 on, current Dublin property prices index should read around 91.2. So we are somewhere 25-26% below 'sustainable' levels of house prices, if these are measured by inflation-linked price appreciation, or 24% below ECB-targeted rate of inflation. You do need quite a powerful telescope to spot the bubble in Dublin markets from here. Which, of course, should not be read as 'there is no bubble', just as 'we can't yet tell anything about bubble being formed'. Personally, I don't really understand why prices are being compared to inflation. Wouldn't it be better to compare them to earnings instead? That is, after all, how we measure housing affordability - the ratio of price to income - and if that's too high, that is when I would call a bubble. AFAIK median house prices are going up, but median earnings are either stagnant or going down, depending on where you look. I'm not sure the period from 99-01 is without it's problems as property prices had started to accelerate from 94 on wards. Personally I bought a property in 95 to sell it in 98 for double its purchase price. - Those with cash should consider their opportunity cost (which I'd argue they aren't) of tying up the capital in property. Property, unlike any other commodity in the CPI, is not purchased as an intra-year purchase, rather in a normal functioning economy (what's that?!) property is purchased over a 20-30 year period from a financial institution. In order to compare apples to apples, the intra-year cost of a house, wherein cost of credit is a relevant cost, would be a more illustrative comparator. Clearly, while boomtime costs were significantly higher, cost of credit was much lower than today. My core argument is that the current rise in house prices is not a function of either increased salaries or credit, but rather increased (irrational?) confidence by cash buyers. A market where >50% of transactions are accounted for by cash buyers is not sustainable in circumstances where there are not a significant number of opportunities in the IRish economy to generate cash. If a bubble is semantically defined as a sharp rise in prices arising from loose credit, then technically, sure, there is no bubble. There is however another name for a market rise brought about by buy-in of cash investors, reliant for continuous growth only on sustained buy-in from cash investors, in the absence of which it collapses: a ponzi scheme. Take your pick.